Employment is widely seen by reentry service providers, researchers, policymakers, and people who were previously incarcerated as crucial to a person’s successful reintegration into the community and decreasing their risk of recidivism. Yet the stigma of incarceration and having been out of the workforce for a period of time often contribute to the challenges people face when trying to find a job after release from prison or jail. People who have been incarcerated earn 40 percent less annually than they had earned prior to incarceration and are likely to have less upward economic mobility over time than those who have not been incarcerated, according to a 2010 report from The Pew Charitable Trusts. Contributing to the challenges involved in reentry is the fact that individuals who are in the criminal justice system often have had limited educational opportunities or attainment; a Bureau of Justice Statistics study found that the majority of individuals incarcerated in state prisons lack a high school diploma or its equivalent. 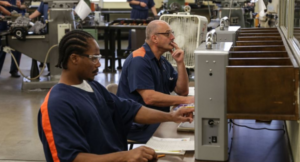 Because education is strongly tied to a person’s employment opportunities, providing educational and vocational programs to adults and youth during and after incarceration is critical. A study by the RAND Corporation—which was funded through a Second Chance Act (SCA) grant—found that, on average, people who participated in correctional education programs were 43 percent less likely to recidivate upon release and 13 percent more likely to secure employment than those who had not participated.